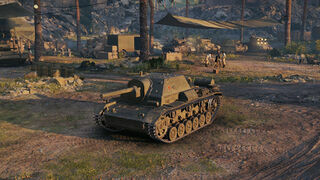 The SU-76I is a Soviet tier 3 premium tank destroyer. The first prototype of the SU-76I ("I" stands for "foreign" in Russian) was created in March of 1943 on the basis of the captured German StuG III and Pz.Kpfw. III vehicles, and featured the Soviet 76-mm F-34 gun. A total of 200 vehicles were manufactured. The SU-76I participated in combat actions until the summer of 1944 and was used for training purposes until the end of the war. 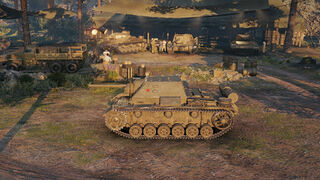 The SU-85I was supposed to become the next stage of vehicle development. Briefly made available in the gift shop in November 2014, the SU-76I was quickly withdrawn from sale by Wargaming. The Red Army experienced a need for light SPGs armed with 76 mm guns as early as Fall of 1941, but that need was not met until December of 1942, when production of the SU-76 SPG began. Sadly, production was dragging slowly, and the vehicle ultimately ended up a bust. The need for a light SPG didn't go anywhere. In order to meet the army's needs, factory #37 converted Panzer III's and StuGs to use an F-34 76 mm gun in a fixed casemate. "According to GOKO decree #2758 from January 18th, 1943, factory #37 and TsAKB NKV designed and built an experimental prototype of a SU-76I SPG on the chassis of a captured StuG SPG and PzIII tank, using a stock 76 mm F-34 tank gun. 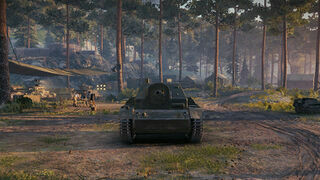 In March of 1943, the vehicle was tested at the Sofrino proving grounds over 280 kilometers of travel and 434 rounds. The SU-76I was a continuation of the SG-122 design, along with some improvements, like sloped armour. Originally, the project called for a ZiS-3 gun (which was later installed on the SU-76), but the only way to provide proper mantlet protection was to use an F-34 in a special frame (indexed S-1). Armour reached 50 mm in the front. The SPG kept its 300 hp Maybach engine. 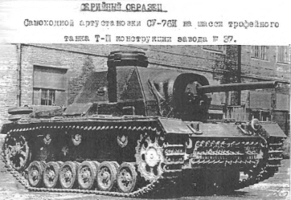 Due to the fact that vehicles of different makes and models served as a base for the SU-76I, various SPGs of this type can look slightly different. It is not known exactly how many of these vehicles were made from StuGs and how many were made from PzIIIs. According to M. Svirin, the total amount of SU-76I and SG-122 vehicles built with captured StuG hulls only equalled eight. An interesting point: the decree that accepted the SU-76I into service pre-dates its trials by a month and a half. The Red Army must have really needed those SPGs. 611 SU-76I vehicles were built (compared to 550 of the original SU-76 production run). By the end of 1943, there were almost no SU-76Is left in the army, and in the beginning of 1944, the last of them were transferred to training units. 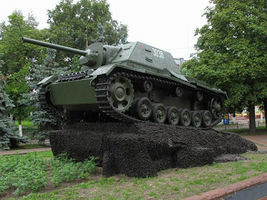 To this day, two SU-76Is remain: an authentic one at Sarny, Ukraine, and one with a restored casemate at the Poklonnaya Gora museum in Moscow. This page was last modified on 27 January 2017, at 22:19. This page has been accessed 35,544 times.